Never one for bucket lists, as I was working on a story for an In-flight magazine, I thought why not make this list of ’25 Things To Do in 2018′ my own?? & here I am, beginning the new year with a list, even if it isn’t a list of resolutions!! What’s your travel wishlist for 2018? Did I miss something? Let me know in the comments below. If the walk along the iconic Om beach – that gets its name from its shape – was a trail in itself and the Shiva Climb there on the beach, a trek in itself, Gokarna has much more to offer both in terms of trails and beaches. Beach trekking is unique to this part of the coast as the beaches along this stretch are sandwiched between the Western Ghats and the Arabian Sea. Wish: To ascend and descend hills, climb over boulders with the waves lapping at your feet…all just to get to the beach! Best Time to Visit: October – March. It is pleasant in Gokarna around then. 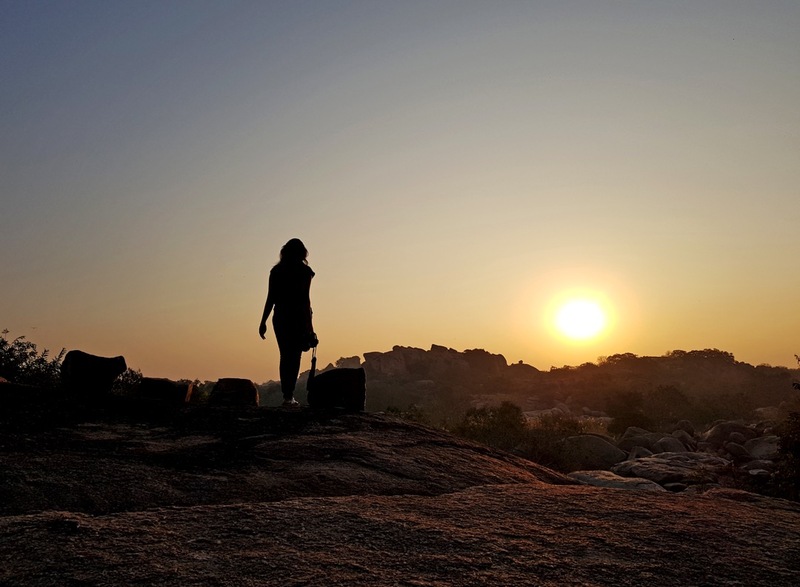 Hampi is a landscape dotted with boulders and massive granite monoliths. So much so that this temple town that doubles up as a hippie haven is touted to be the largest bouldering area in the world. Bouldering is pure rock climbing at its very basic. Leaving behind ropes and harnesses one climbs short but tricky boulders using only one’s strength, balance and technique. The only equipment if any is the bouldering pad that one can keep at the base of the boulder to manage the risk of falling. Wish: Why not? Hadn’t even heard of it when I booked my tickets to Hampi! Best Time to Visit: December – January. Hampi is super hot, so the cooler months. Little does it come as a surprise that the destination which made white water rafting fashionable in India also boasts of being home to the highest bungee jump in the country. The fixed platform in Mohanchatti which is at a height of 83 metres extends up to the middle of the valley and then it is a jump right down to within touching distance of the eddying waters of the river Ganga. Best Time to Visit: October – May. Come monsoon and all the action pauses, here, in the adventure capital of our country. To pitch a tent amidst the magnificent Himalayas on a freezing summer night and to sleep under the skylight sky is amazing enough in itself. But if the campsite was to be at the Chandratal Lake, this remote and not-so-easily accessible crescent shaped Moon Lake, there then you have the trip of a lifetime guaranteed. On that life changing trip back in 2013. Best Time to Visit: July – October. The only time that the road is open. Well, they say it is the thrill of discovery. Venturing into the dark unknown and coming up on fossil passages, limestone stalactites and stalagmites, bats and other endemic creatures. There are more than a thousand cave systems in the hills of Khasi, Garo and Jaintia, waiting to be explored. Extending to a formidable 30,397 meters, India’s longest cave, the Krem Liat Prah is also one of them. Wish: Ducking through jagged outcroppings in a cave, finding my way through rocks and water, chancing upon discoveries. Best Time to Visit: December – March. Winter is when the water levels in the caves are at their lowest. The name says it all, you simply jump off a cliff into the waiting waters below. A two and half hours drive from Shillong, the turquoise blue waters of the Dawki river surrounded by the dense foliage of an equal intense green make for a picture perfect setting to do that. Wish: To take that plunge. Dive straight off a cliff. Best Time to Visit: March – April. Dawki is said to be at its beautiful best in Spring. An off roading experience in the sand dunes of a desert that is Dune Bashing for you. & the only off roading I have done so far is on man made tracks. Read: Have I found the perfect partner for my Road Trips? So, in Jaisalmer it should be a rollercoaster ride through the dynamic shifting sands of the Thar Desert. Wish: Yay, stormy sea of sand. Best Time to Visit: November – March. Winter is usually the best time to enjoy the outdoors in a desert. Shoot out of the water and fly in the sky, Ironman style. That is flyboarding for you, the latest water sport to hit Goa. A jetpack powered by a jet ski propels the rider up on a buoyant flyboard, that is quite similar to a hoverboard; only this one allows you to ride in the air, upto to fifteen metres above water. This forceful water powered jet pack can push you both into the sky or underwater. Wish: To learn how to swim and then Go Goa! Best Time to Visit: October – May. When the skies are clear and the waters fairly placid. Nothing spells romance like catching the sun rise behind the iconic Taj Mahal, from an early morning flight in the sky. Wish: To take a hot air balloon ride against the stunning white marble mausoleum. Best Time to Visit: September – March. Hot air ballooning is an activity for the dry season. PS: A six day Taj Balloon Festival happens in November every year, and that could be an interesting time too, for a view of the Taj Mahal from a vantage point like no other. Think beyond the houseboat. Go kayaking in the narrow inland canals of the famed backwaters of Kerala, in where a house boat wouldn’t reach and watch the villages come to life as dawn breaks. Revel in the bird call, all while paddling low in the water. Wish: To wake up with an ache in my arms from a morning well spent. Best Time to Visit: November – February. Mild Winters. Bir Billing is synonymous with paragliding in India. This beautiful Himalayan valley in Himachal Pradesh even hosted the Paragliding World Cup in 2015, where pilots from over a hundred and forty countries participated. Soaring over the Kangra valley with wondrous up close views of the Dhauladhar Ranges, a paragliding flight lasts from anywhere between fifteen minutes to thirty and can be done either solo or in tandem. Wish: To take off at an altitude of eight thousand feet above sea level in Billing and land four thousand feet below in Bir. Best Time to Visit: December & January OR the rest of October to June. All through the year except monsoon is paragliding season. But here in Bir Billing paragliding season can be divided between the snow covered months and otherwise. Tarkarli Beach in Malvan, Maharasthra, along the Konkan coast is quickly emerging as the hub for water sports. This eight kilometre stretch of white sand beach runs parallel to the backwaters of the Karli river, extending upto the Devbaug Sangam where the river meets the Arabian Sea, making for a unique location to go parasailing. Wish: To glide like a bird in the open skies, as my parasail wing catches the wind and watch the confluence of the backwaters and the sea. Best Time to Visit: October – March. While there is the chill of winter to counter the tropical humidity of the coast. Very much like zip lining, river crossing involves crossing a river in a harness on a rope and in Dandeli it is the fast flowing river Kali that you cross. A mere two hours from Goa, Dandeli has always been the destination of choice for the discerning adventure seeker when it came to water sports. But river crossing, which is only now gaining popularity, should be quite a change from the regular zip line. Wish: To go whee over a river and not get dizzy at the terrible current!! Think Coorg and you think of leisurely strolls through the mist laden coffee plantations in the quiet country side of Karnataka. But Coorg isn’t just a hill station, for come monsoon, the Scotland of India turns into a hot spot for river rafting or white water rafting as it is called. As the river Barapole drops from the Bramhagiri range of the Western Ghats into the rocky landscape, it turns turbulent, gushing through the forest, over the rapids and into the Bramhagiri Wildlife Sanctuary, making it ideal for rafting. Best Time to Visit: July – September. Monsoon is your season for rafting. It is the quintessential Himalayan road trip, needing no introduction. A road trip along India’s most celebrated route, the four hundred and eighty seven kilometre stretch between Manali to Leh, is the stuff of dreams. From the twenty one hairpin bends of the Gata Loops to the five high altitude Himalayan Passes you cross, this road trip from Manali to Leh cannot but be the trip of a lifetime. Wish: I have been on both ends of this route, on two separate road trips. Now I want to go the entire length. Best Time to Visit: May – September. The Leh – Manali Highway, as it is called, is open for a little more than the four months of Summer. Besides it is also peak tourist season in Ladakh when the stark landscape comes alive in all the glory of its summer colours. Going underwater in the open ocean, exploring the stunning world of beautiful coral reefs and watching life go by in that suspended moment, Scuba Diving opens up realms that one has otherwise only imagined. The tropical island of Havelock in the Bay of Bengal is home to some of the most popular dive sites of India. Starting with under twenty metres, one can choose from any of these dive sites that can be reached by boat, based on one’s experience and PADI certification level. Wish: That ultimate adventure once I learn to swim, to explore a realm that has before now been inaccessible to me. Best Time to Visit: February – March. Though November through April is scuba diving season in the Andaman and Nicobar Islands, these two months offer the best chances of calm conditions. Packed up cosily amidst the snow kissed peaks of the Himalayas, Auli has only lately risen to popularity as India’s top destination for Skiing. Offering beautiful views of the Nanda Devi Peak, Auli is along the route to the Valley of Flowers, Badrinath and the trek route to Kauri Pass. A cable car operates from Joshimath to Auli during the day and one can take this four kilometre ride up to get to Auli, stay at any of the resorts that have now mushroomed here and ski along the gentle slopes of the Garhwal Mountains. Best Time to Visit: January – March, when the slopes are carpeted in thick snow. With its living coral reefs of varied and brilliant hues glistening through the crystal clear waters of the lagoons surrounding the various islands of Lakshadweep, there can be no better destination in India for snorkelling. All you need is a basic familiarity with swimming and with a mask, snorkel and a set of fins you are raring to go. The shallow waters here only help, making it easier for anyone wanting to take a peek into the ocean, at the spectacular life underwater. Wish: One step before that dive? Best Time to Visit: December – April. Pleasantest months for a generally humid tropical island. Snow Boarding came later, but it sure is more intense than skiing, for it is all about balance and you virtually have no other control, neither on your speed nor in the manoeuvring. It takes upto five days for one to get a hang of the sport and to begin enjoying the slide down the snow clad mountain slopes at dizzying speeds. So prepare to set aside atleast a week to embark on this adventure. Owing to the popularity of the destination, equipment is readily available and easy to rent. Wish: To go on a long holiday and do nothing but chill at the resort and indulge in all the adventure that they have to offer! Best Time to Visit: December – February. When the ski capital of the country disappears under a thick blanket of powdery snow. Located on the west coast of India, Mulki is a little ashram town and now a surf town, just north of Mangalore. Pretty late in catching on the wave of surfing, India’s first surf retreat stands here in Mulki. Here is the Ashram Surf Retreat where you can get surf lessons on your holiday and even try out their surf yoga and wake boarding. Wish: To turn hippie in search of that adrenaline rush. Best Time to Visit: May – September. The season for surfing in India is during monsoon and for a few weeks before the start of monsoon. It is when the big waves come in ranging from anywhere between eight feet to fifteen feet. A UNESCO World Heritage Site, the Valley of Flowers is a breathtakingly beautiful high altitude meadow of alpine flowers in the Himalayas. The trek route to the Valley of Flowers goes through the same base camp, Gangharia, as the one to Hemkund Sahib ( the world’s highest Gurudwara and an important pilgrimage centre for the Sikh) and diverges along the way. Owing to which this trek route is not just very popular but also logistically one of the best equipped. From helicopters that fly in to the base camp every twenty minutes to mules and porters that take on from there, there are enough arrangements to ease your trek if needed. Wish: Last year, I chose to stay back in Ghangaria and not attempt the one day trek to Hemkund, after the Valley of Flowers. This year, I wish to grow in confidence and complete the trek. Best Time to Visit: July – August. When the valley is in full bloom. Somewhere between Mumbai – Pune in Maharashtra is Kolad, where the river Kundalika comes gushing down in a cascade from the western ghats. In a twist to the usual rappelling or abseiling, where one comes down a rock face in a controlled descent, in waterfall repelling one does it through a waterfall. Wish: To climb up the craggy outcrops of the Sahyadris and come down the torrential waterfall in one continuous swoop, suspended only in a harness. Best Time to Visit: June – September. Monsoons = Waterfall season in India. Named after the river Kabini, this former hunting ground of the Maharaja of Mysore in the Nagarhole National Park is famed for its open jeep safaris and sightings of leopards and elephant herds. A safari in this lesser known South Indian national park made it yo my list of things to do this year, not just for the fact that it is home to the rare black panther but also because one does get to catch a glimpse – and quite frequently – of the Sloth Bear, the Malabar Giant Squirrel, packs of wild dogs or even that elusive tiger in its natural habitat. Best Time to Visit: March – May. When the dry summer draws out the animals to the edge of the river and sightings are more likely. To fly over the dense green deodar forest of Mussoorie, on the highest zip line in India. Going upto speeds of ninety kilometres per hour this zip line at Clouds End in the Mussoorie Adventure Park is also the longest zip line in the Himalayas. Wish: For that feeling of flight. Best Time to Visit: April – June. Peak tourist season in Mussoorie and also the best time to go zip lining, for the Himalayan summer makes it a pleasurable experience. From a honeymooners paradise to becoming the gateway to a road trip to not just Ladakh but also the Spiti Valley, Manali has come a long way. And, the latest activity to catch the fancy of adventure seekers here in Manali is zorbing. So, what does one do while zorbing? Simple really, just get into an orb and roll down the mountain through the green open spaces and take in the view. Much like the hamster ball chase scene in Jurassic World, only minus the dinosaurs. Wish: To imagine being chased by dinosaurs. Best Time to Visit: March – June. Summers, when one can roll unencumbered by snow or slush. What’s your travel wishlist for 2018? Did I miss something? What an amazing list! I’ve just posted my Zorbing photos, what an experience! My partner also tried the aqua zorb (with the water inside). Luckily, he brought a change of clothes. The other guy in the photo didn’t and had a very unpleasant journey home! A little bit, I have a fairly strong constitution but it made my stomach churn! While dune bashing is one of the most fun activities in the desert, you should definitely try eating atleast one of your meals in Suryagarh. It’s amazing.. especially dining under the starlit sky. Also, Gulmarg is a superb place to go.. when it’s snowing. What a fantastic list…simply superb, wish you explore all these places with fun and adventure. Btw, can i join you while visiting Hampi…just kidding, what i wanna say is…such architectural works of ancient India attracts me a lot. So many things I’ve never heard of! A great post to kick start the year! 😄 Yes!! So much in India even for the adrenalin junkie. Thank you. ☺️ Glad you enjoyed it!